In the customer provided images, there are pictures of an aged (antique) finished version. Is that version available for sale in North America? Will Pyramyd be selling it soon? Not yet, hopefully will be soon. The product description says 2 co2s. what happens if i put 1 empty co2 and 1 full co2? will it work still? 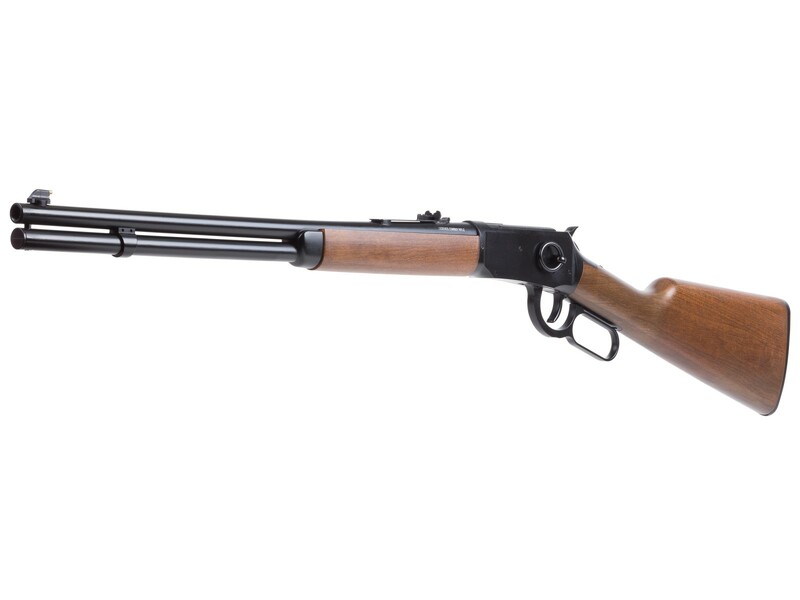 best pellet to shoot with a Legends Cowboy Lever Action BB rifle? Can the pellets be inserted in the BB cartridges or do I need to buy the pellet cartridges? Do you have to use 2 CO2 cartridges, or can you put 1 used one in to fill the space. Also, is there any difference in FPS with 2 CO2 cartridges? The ones in the European videos seem to have a "weathered" finish. Are there two different versions? You can do the one full one empty method in this gun. No difference in velocity, just a difference in number of shots. Yes, there is a weathered version floating around overseas, has not made it to the US yet. I have only seen the gold metal front sight. Pellets work great and hit with authority. I use 7.0 gr. Why is this Legends only a 90day warranty? Umarex typically has 3 yr warranties. All the replica Umarex products have a 90 day warranty. Says something about their confidence in the products. Most of the CO2 powered products only carry a 90 day warranty. How often should you lubricate the lever mechanism. I have a sack full of pellet shells made for the peace maker. will they work in this gun? For shooting pellets, do i need different shells ( like from an SAA pellet version) , or i can just use the shells that came with it ( bb shells) ? Also, i have the same question abaout the Colt SAA bb version. Being one of those who would dare show interest in rifling, are their any tests comparing the accuracy of this pretty CO2 BB gun with a Daisy Red Ryder? Since it uses a C02 arrangement similar to a QB rifle I wonder if a bulk fill cap could be made or modified, that would make it a must have for me. can this rifle fire pellets safely? is the "wood stock" made out of real wood, or out of a synthetic material? How do I remove a jammed BB? With the ejection port open, I can see the BB lodged in the barrel. Holding the rifle upside down, I tried using a .177 ramrod to gently push the BB out, but it isn't moving. I'm afraid if I push hard, something might be damaged. What should I do? I just got this rifle after it was backordered for some time. I put the Co2 in, and did an unloaded test shot. I heard a pop noise, so I thought everything was working correctly. I loaded a BB and fired the rifle. I thought I missed my target, so I tried another shot. That's when I notice a BB lodged in the barrel. I'm guessing it was too cold out, so the air pressure was too low? I'm worried my first shot wasn't a miss, but instead maybe that BB never made it out of the barrel. So, I'm thinking there might be two BBs jammed in there. I'm waiting to speak with Umarex before I try anything, but I'm curious if the air gun community here has any recommendations and or ideas. Thank you. My suggestion would be to give a few good taps with the ramrod. Assuming it is appropriately sized, you're not going to hurt anything. Give it a few taps with a mallet and you should be able to dislodge the BB. What is the true FPS? PA list this as 600 FPS. Umarex list it at 410 FPS. Dennis tested it with around 430 FPS. Which is it????? The package for the Cowboy says 600 fps, so that is how it is listed. Hi all, saw a u tube video from overseas and the gentleman was shooting led pellets from this rifle fairly accurately. What do you think Tyler? I don't see why not. Folks do it with the Single Action pistols all the time. Accuracy may not be great, but I'm sure it can be done. I shoot both Peacemakers and Dan Wesson cartridges from my Colt revolvers. Will both work from my new Umarex Legends Cowboy rifle? Thanks! Can the current 12/17 in stock be relied upon? Or is it going to slip again? There are videos all over You tube of this rifle being shot by Europeans. Had been out there for months. Why is it not yet available inthe US? Does anyone know when Umarex is going to release this puppy? Or are they gonna keep it tied to the porch? Good question. Can't say I have heard any updates on this one. I just noticed that the new available date is in November! Pushed out yet again from 3/31 to 6/7 to 8/6. I pre-ordered this gun in March so I am a bit disappointed at yet another delay. Hopefully this new delay is to perfect any problems. Perhaps someone can tell me why some of you are placing emphasis on rifling the barrel, and bringing out a pellet version of this gun? Don't you realize that there are already hundreds of pellet guns for sale that deal with accuracy, power, and distance shooting, and that this is a short range, CO2, realistic style, plinker gun that is made for fun, backyard, 10 meter, tin can shooting and not much more? Enjoy it, and stop trying to make it more than it is! I support your question Highly, William. I am interested in High Quality, bb shooting, lower powered, rapid firing fun plinking guns. There less noisy for indoor and small backyard use, Cost less when shooting rapidly alot, no lead dust hazard, and bbs generaly feed much better through well designed guns than lead pellets do. Theres NO reason a lower powered, bb plinking gun "Has" to be made like a cheap toy, like many are for the kids. Steel bbs will Not wear the bore of a barrel, if it is a smooth bore, not rifled. High quality, yet still very economical steel bbs (compared to pellets) are capable of surprising accuracy in the higher quality guns, still ment for closer range targeting and plinking. Not talking hunting. Not every one wants power,power,power, all the time. Hi, William. Pellets are softer than BBs, and won't wear out the barrel as quickly. The added accuracy and speed would be bonus points. Considering that there's a revolver that operates similarly to the Umarex Peacemaker, and uses cartridges that hold lead pellets, I don't think it's an unreasonable request. My feelings exactly. If this rifle does not deliver better velocity than 410 fps it is dead on arrival. Hi guys couldn't we just use the H&N Excite Copper coat lead BB? They do fit in the shells. Couldnt disagree more. Not about macho, it is about an airgun for more distance , with accuracy a d power, especially for metal reactive targets. Ventilating soup cans instead of paper is more fun . Pellet pistols hit hard over longer distance with greater safety. You follow? My dear Michael from Macho USA, If the Quality is there, feeding, smooth action, decent bb accuracy, durability, holds gas, etc. I Welcome its arrival. For me, the 410fps is just about right! More gas economy and consistent velocity in shooting! Keep it a good Quality "BB", shorter range plinking rifle! If the product works well and shoots well, I disagree. This is a fun gun, made to be a plinker...and maybe a training tool for cowboy action shooters, the velocity doesn't really matter if it's accurate and functions as it should. I am confused, with a barrel length of 19.25" how can the muzzle velocity be only 410 fps? Also my Umarex 1894 Wells Fargo lever action with a similar barrel length but, has a muzzle velocity of over 650 fps and still is a joy to shoot! What gives Pyramyd Air? Didn't say that at all. I do however, look at most of these things with skepticism until I can actually test the real thing myself. Point taken, not a PA 'mistake' but you admit the ballistics math does not appear to work out. Now all we can do is wait till the Fall and the Umarex gun to arrive. What gives PA? More like What gives Umarex.....the specs are published by them, PA is just posting what they are given. Until there are samples or production models to test, we won't know if those are real world figures or not. why isn't it just called a Winchester model 94 and not "legends cowboy rifle"
What is the hpld up on making these available? how is it with-an almost 20 inch barrel , this rifle gets the same velocity as a 5 1/2 barrel revolver. I strongly agree with the above above observations. Particularly styling this rifle with the Model 73 which was at the historical height of the American cowboy era! Plus an airgun collector wants a 400fps gun they will purchase a SAA Colt, please correct the power to match purchasing a long air arm! Keep up the excellent comments and my the industry be reading them. Well ,I did. They stated that the barrel is full length. They stated, but were not certain that the valve was tuned for the lower velocity. Since the rifle is targeted for the US market , it should have been tuned to the advertised 530 plus fps. They also stated there are no plans at this time for a rifled barrel version. Not well thought out . The rifle should have been made on the Winchester 73 or92 platform .That way it would have been unique to the US market, and not stepped on the toes of the Walther pellet version. Good question, I'd recommend reaching out to Umarex and asking. Are both the forestock and the stock made of wood? Thanks Tyler. The original specs said it was a wood stock. I thought it was too good a price for wood. Will this rifle use the same "BB Cartridges" as the Colt Single Action Army? If I remember correctly, BB's are .172 caliber, not .177. Correct? I've been waiting for this one. I don't see it on the Umarex site though. Is it really coming on March 30? Hoping it will be out by the summer. Will there be extra cartridges available to be purchased in lots of 10? Not sure on the quantities but they are already available in sets of 6. Can the lever be cocked with one hand inside of the lever instead of grabbing the bottom of the lever like shown in the video? Will they offer a rifled barrel/pellet version like thier peacemaker revolvers? No, the stock and fore-end are plastic with fake wood finish. For the price, it should be wood. Will it have a rifled barrel pellet option?! This NEEDS a rifled barrel and pellet option!! Im throwing my wallet at the screen as it is! I have a few of the simulated ammo style cartridge loading guns like the Colt Peacemaker, the Dan Wesson models, and a few others. Are the "cartridges" from the Peacemaker the same ones used in the lever action? Are there any other "rounds" that will fit and function in the lever action rifle? Can .177 pellets be used instead of .177 steel BBs? Doesn't show on UMAREXUSA web site. Discontinued? It shows at Umarex now and reads 3-30-18 available date. Is there a PRE- ORDER option available? To be considered a firearm in Canada you need to exceed BOTH the FPS AND the Foot/Lbs limits. This is the law "velocity greater than 152.4 meters per second (500 feet per second) AND a muzzle energy greater than 5.7 joules (4.2 foot-pounds)" which is not going to happen with a 5.1 grain BB. If you do the math, a 5.1 grains BB coming out at 535fps gives out 3.24 foot-pounds. This shouldn't be PAL rated. Would think a rifled barrel pellet version would be in the works. That said will probably grab a bb version as soon as available since I have both bb and pellet Peacemakers. When , realistically will these be available? Umarex Legends Cowboy Lever Action description says Rifled barrel, is that right? Yes, please Umarex: Are you listening? Rifled barrel, pellet shooter, higher velocity, or at least 2 out of 3. Later offer a silver finish version, then later a Henry replica!! Oh yeah!. Then after that a Sharps replica, rifled barrel, pellet shooter. I can dream. ARGHHH! bummer, what a tease, I will just wait to see if a pellet version comes out, there is no reason not to, the whole design would already be good except the barrel. For me and a bunch of others smooth bore BB only is a $150 max value, but I would jump at a $200 rifled pellet version. Umarex are you listening? Will it shoot pellet cartridges as well?